Ferrari made headlines this summer after a 1962 Ferrari 250 GTO became the most expensive car in the world when it sold for over $38 million at a California auto auction. The model, chassis number 3851GT, was number 19 of just 39 250 GTOs ever produced. As such the vehicle had been highly anticipated and discussed prior to the auction event and buzz generated quickly about its hefty reaping. So what makes the 250 GTO’s so special? Actually, quite a bit. The Ferrari 250 GTO was originally produced between 1962 and 1964 as a racing vehicle for the FIA (International Automobile Federation) Grand Touring category 3, which in turn is where the racer got its name. GTO stands for “Gran Turismo Omologato”, or Grand Touring Homologated, which is in reference to the type of racing while the numerical component references the displacement capacity of the powerful engine cylinders that give the model its speed. Originally the sales price for a new Ferrari 250 GOT was $18,000 on the American market, and at the time all buyers had to be personally approved by Enzo Ferrari himself and his North American dealer. Between 1962 and 1963, Ferrari produced 33 250 GTO models with their original body styling, which can be found on the recently auctioned model. 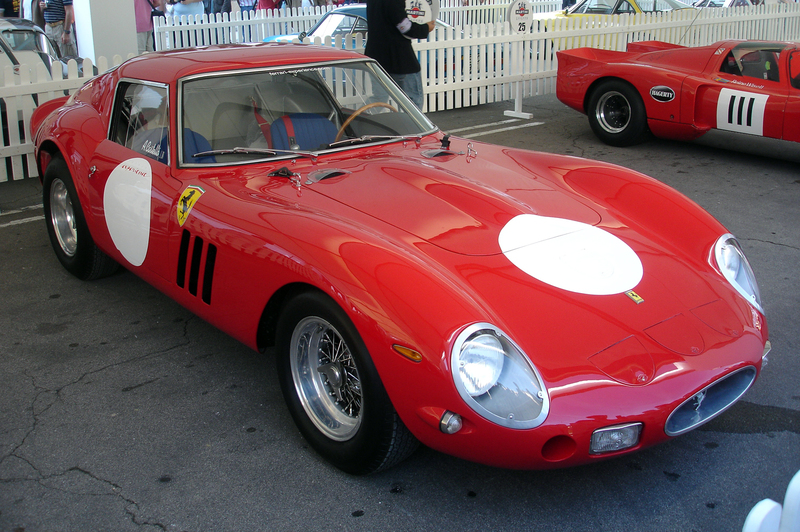 In 1964 Ferrari produced only six more 250 GTOs sporting an updated body and adjusted styling features. Such rarity highly contributes to the draw and prestige of these vehicles, which in turn sets their value on the collectors markets. However, the scarceness is not the Ferrari 250 GTO’s only asset. As previously mentioned, the 250 GTO was designed to compete in GT racing where it was set against some of the fastest and sleekest vehicle in the world. At the time its rivals included models like the Shelby Cobra, Jaguar E-Type and Aston Martin DP214. As such, performance was paramount when designing the 250 GTO and it took a team of Ferrari engineers to craft the racer. While typically credited to Giotto Bizzarrini, as he was the initial lead engineer on the project, the 250 GTO’s creation actually passed through a number of hands, especially in 1962 when many of the major engineers were fired due to a dispute with Enzo Ferrari himself. The body design and further development of the 250 GTO was then spearheaded by engineer Mauro Forghieri and Sergio Scaglietti. One of the most acclaimed features of the 250 GTO, it’s stunningly sleek body styling, was the result of incorporating extensive aerodynamics research into their design in an attempt to improve top speed and stability. According to experts, the final 250 GTO’s body design was shaped based on both wind tunnel testing as well as road and track testing of several prototypes and in fact continued to change and evolve through the course of the vehicle’s production. The result was the 250 GTO’s iconic all-aluminium body with a long, low nose, small radiator inlet, and distinctive air intakes on the nose with removable covers. The styling was not only incredibly efficient; it was attractive and would become synonymous with the Ferrari brand. Critis, enthusiasts and collectors adore the model so much that in in 2004, Sports Car International noted that the Ferrari 250 GTO could be the top sports car of all time. At Condon Skelly, we know how exciting collecting classic muscle and sports cars can be. That’s why we specialize in offering complete collector auto insurance. We’re a group of collectors, enthusiasts, and professionals who specialize in insuring all types of collector vehicles. Our team is as passionate about protecting your vehicles as you are about collecting them. We can help you secure affordable, industry-leading specialty car insurance coverage to protect your classic, antique, or exotic vehicles. For more information, contact our collector auto insurance specialists today at (866) 291-5694. The Merriam-Webster dictionary defines muscle cars as “any of a group of American-made 2-door sports coupes with powerful engines designed for high-performance driving.” In social circles, the term muscle car is typically used to refer to a variety of high performance automobiles which have emerged from a number of manufactures in many different countries. All the while, collectors, traders, and enthusiasts still debate what exactly the defining features of a muscle car are. To understand what a muscle car is we must first look at their origins to determine what is it not. The origin of the muscle car itself is highly debated, but many enthusiasts and experts credit the 1949 Oldsmobile Rocket 88 as the first ever American muscle car and the spark for this new classification of vehicles. The Rockett 88 was created in response to public interest in speed and power, featuring a heavier body than most racers and America’s first ever high-compression overhead valve V8. During the 1950’s various automakers began to showcase high-powered engines and other heavy performance hardware in flashy limited-edition models of their vehicles. The 1955 Chevy C-300 was released to huge success on the NASCAR scene. Sporting a flashy blend of Hemi power and luxury-car trappings the C-300 boasted a 300 horsepower engine. As interest grew in stock car racing, automakers and enthusiasts became infatuated with the potential of muscle cars. However, it wasn’t until the 1960’s that interest in these high-powered street racers finally peaked. Experts suggest that the original intent of the muscle car was to put the most powerful motor that would fit, into the lightest car possible. During the 1960’s Dodge, Plymouth, Chrysler, Ford and others battled it out to create the most powerful drag racer. Some experts refer to this period as the golden age of American muscle cars, as some of the most sought after muscle vehicles were produced over the following two decades. The muscle car horsepower war peaked in 1970, with some models advertising as much as 450 horsepower drawing in young auto enthusiasts into show rooms who demanded standard editions of these racers. Although the sales of true muscle cars were relatively modest, they became invaluable for American automakers in terms of prestige and publicity. High competition among manufacturers meant that buyers had the choice of ever-more powerful engines in varying body styles and performance capacities. Traditionally, muscle cars differed from other racers in two main ways. They had higher powered engines, which in turn made them heavier and ultimately lead to the adoption of the larger body styling. Unlike their sports car cousins, a muscle car bodies were based primarily on those of a mid-sized sedan, converted to a two door style. Designed to be as high-powered and cheap as possible, American muscle cars were originally lacked many of the bells, whistles and flash that sports and luxury models featured. 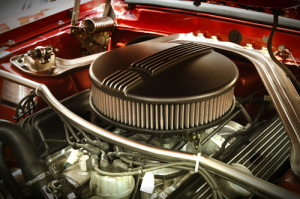 Over time they began to incorporate many additional add-on features based on popular demand and to improve market appeal, however the raw power of American muscle engines remain the largest draw for enthusiasts, collectors and consumers today. At Condon Skelly, we know how exciting collecting classic muscle and sports cars can be. That’s why we specialize in offering complete collector auto insurance. We’re a group of collectors, enthusiasts, and professionals who specialize in insuring all types of collector vehicles. Our team is as passionate about protecting your vehicles as you are about collecting them. We can help you secure affordable, industry-leading classic car insurance coverage to protect your classic, antique, or exotic vehicles. For more information, contact our collector auto insurance specialists today at (866) 291-5694. According to the Merriam-Webster dictionary, by definition the term “exotic” means “very different, strange, or unusual”. Often applied to the physical appearance of an object or individual, the term “exotic” has also adopted the connotation of intrigue, mystique and complexity. When applied as a term used to both describe and classify vehicles, auto experts and enthusiasts have a few distinct criteria an auto must meet to be truly classified as an exotic vehicle in auction or appraisal. Rarity- A fundamental tenant of an exotic vehicle classification is that they are difficult to come by. Limited production models, for example, are often some of the most prized and sought after vehicles and often fetch millions of dollars at auctions and private sales. Original batch vehicles, or models which were originally built to be made in limited quantities but became widely popular that the public demanded more, are also highly popular among collectors and enthusiasts. Exotic vehicle producers do not intended to sell to the general population, but rather appeal to a very specific buyer market. Their prestige and appeal are often generated as a result of their rarity and unattainability to all but a select few. Customization- Exotic vehicles are often hand assembled, or created through non-standard manufacturing processes. These vehicles often rely heavily on personalization and customization and are typically built exactly to the specifications of either the owner or the designer. They also tend to incorporate new technologies, materials, and other non-traditional components into the function and design of the vehicle. Exotic vehicle will often have a story of creation which typically includes personal history of individuals or design teams. Most exotic vehicles will have “pedigree” papers or original documentation of all owners, dates of purchase and sale, maintenance records and other documentation. Performance– A key feature in many exotic vehicles are the extensive design elements geared towards enhancing the driver’s experience. Many exotic vehicles have competed in race or competitive environment, while others were designed for high-performance speed and driving pleasure. As opposed to other classes, the emphasis for exotic vehicles is most often speed and handling capabilities, along with style. Look- Aesthetics are fundamental tenet of exotic vehicles design and classification. By nature, exotic vehicles tend to have strange and unusual appearances from concept to design. Many include unusual functions such as non-standard door designs or aerodynamic body designs, or enhanced motor designs, fuel systems and other features. However, exotic “look” is an ever evolving concept, what may be considered “exotic” in one generation of vehicles may become the norm later on. At Condon Skelly, we know how exciting collecting exotic, classic and sports cars can be. That’s why we specialize in offering complete exotic auto insurance. We’re a group of collectors, enthusiasts, and professionals who specialize in insuring all types of collector vehicles. Our team is as passionate about protecting your vehicles as you are about collecting them. We can help you secure affordable, industry-leading collector car insurance coverage to protect your classic, antique, or exotic vehicles. For more information, contact our exotic auto insurance specialists today at (866) 291-5694. Founded in 1903 as the Buick Motor Division, of the Buick Auto-Vim and Power Company, Buick proudly claims its repute as the oldest American auto-brand still active in the industry. The automakers struggled through their first year of production and recovered from near-bankruptcy in 1904 to become the most productive automaker of 1908, manufacturing more vehicles that year than both Ford and Cadillac combined which were Buick’s closest competitors. Originally, Buicks were designed and built to simulate the feeling and comfort of being in a modern American living room, which earned them the nickname the “moving couch of America”. Known for their large spacious interiors and opulent body styling, Buick’s became incredibly popular with the wealthy, especially with British royalty. After the war, Buick expanded its facilities and production rapidly increased as did sales. In 1908, the original Buick Motor Company became the first cornerstone of the General Motors Company (GM). Buick’s former general manager William Durant and Buick auto-racer Louis Cheverolet founded GM. Durant had lead Buick to become the largest car maker in America at the time and from these efforts he began buying up other American automakers to form the megacorporation General Motors. Durant had a dream for GM that would allow each division to target one class of buyer and focus their efforts on appealing to that demographic instead of competing amongst each other. Buicks was and still remains the second of the top tier of Gm vehicle brands, second only to Cadillac. To Durant, the deal Buick customer would be comfortably well off, and searching for a more refined and less ostentations vehicle than the Cadillac line up. Buick was always on the cutting edge of vehicle design and style. The first Buick made for sale was the 1904 Model B, only 37 of these Buicks were made that yea however none of the originals survived. The automakers would go on the use the Model B as a the basis for subsequent models through the 1909 Model F, and historians and experts suggests that the original 1904 engine was optimally engineered even to modern standards. Production picked up thorough the 1920’s, increasing to over 260,000 vehicles being crafted and distributed to countries around the world in 1926 alone. In 1939 Buick pioneered the use of turn signals in their vehicles, which did not appear on as a feature in other American auto brands until nearly a decade later. In1939, all Buick models became equipped with automatic spark advance and had a mounted shift lever affixed to the steering column. During World War I Buick built Liberty aircraft engines and Red Cross ambulances. When called upon again in World War II, the auto maker turned to building aircraft engines, Hellcat tank destroyers and other military goods. Buick was awarded more than 30 separate military contracts and Buick-built goods could be found at virtually every fighting front. The Roadmaster models became one of the pillars of Buick success, due largely to new engineering and styling innovation. 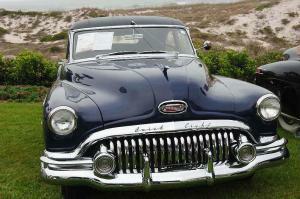 They remain some of the most cherished collectable Buick models in auctions today. Buick’s famous vertical-pillar “toothy” grille was first introduced in 1942, and increased in size and prominence during the post-war era becoming a signature stylistic element of many new Buick models. “Hardtop convertible” styling was introduced on the 1949 Roadmaster Riviera. Buick’s famous “portholes” came along that same year. The Roadmaster was so successful that it was reprised in the 1990’s. At Condon Skelly, we know how exciting collecting exotic, classic and sports cars can be. That’s why we specialize in offering complete collector auto insurance solutions. We’re a group of collectors, enthusiasts, and professionals who specialize in insuring all types of collector vehicles. Our team is as passionate about protecting your vehicles as you are about collecting them. We can help you secure affordable, industry-leading classic car insurance coverage to protect your classic, antique, or collectable vehicles. For more information, contact our collector auto insurance specialists today at (866) 291-5694. One of the most iconic features of mid-century American automobiles is the pervasively curvaceous body styling which began in the late 1950’s and early 1960’s. Stepping away from straight-edged boxy and envelope styling of the early 1900’s vehicles, designers in the mid-20th century began to incorporate chiseled edges, dramatic fenders and curvature into the automotive body styling with both performance and aesthetic intent. To auto enthusiasts and collectors this design has come to be known as Coke-bottle styling, named after the resemblance to the classic contoured bottle design of popular American beverage producer Coca-Cola. Many tenants of Coke-bottle styling were originally crafted by aircraft manufacturers who had been streamlining aircraft design to improve aerodynamics and reduce drag and air resistance for better flight performance. When automakers began incorporating functional curvature, wasp-waste body modeling and other elements into their vehicles, the performance improvements and consumer response was staggering. Throughout the 1960s automakers such as Studebaker, Pontiac and Buick began to incorporate subtle horizontal creases and a slightly pinched middle section which swelled out again in the rear of the vehicles. By 1966, the General Motors A-body sedan had incorporated the softer more aerodynamic curvature into their design with a mid-riff pinch and slightly tilted fenders. 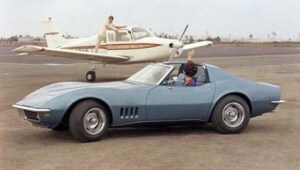 However, it was the 1968 Corvette Stingray which brought Coke-bottle styling to prominence. The new shape of the 1968 Corvette Stingray, first of the C3 generation, featured improved aerodynamics when compared to the C2 Corvettes, an iconic pinched mid-section and fenders which bulged out and arched upwards. The design was adopted in response to racer complaints about drag and high speed front end lift experienced my drivers in earlier models. 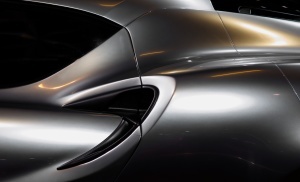 The C3’s new Coke-body styling was so successful that it would be a staple for the next four generations of Corvettes and inspire other auto makers such as Ford, Dodge and GM to adopt similar styling in their sports, muscle and race car models. By the 1970’s tailfins had been incorporated into coke-bottle styling, and the combined design would be adopted almost unilaterally among American and foreign automakers over the next decade. At Condon Skelly, we know how exciting collecting exotic, classic and sports cars can be. That’s why we specialize in offering complete collector car insurance. We’re a group of collectors, enthusiasts, and professionals who specialize in insuring all types of collector vehicles. Our team is as passionate about protecting your vehicles as you are about collecting them. We can help you secure affordable, industry-leading classic car insurance coverage to protect your classic, antique, or exotic vehicles. For more information, contact our classic car insurance specialists today at (866) 291-5694.